In my beginning years of retirement, relatively isolated in rural Minnesota, I put together my own “picture” of what I thought a good design should look like. That had to have been around 1987 or ’88. I tweaked the design here and there, always hoping I’d like the newest one a little better than the last, unaware that other Minnesotans were working on their own flag designs. Then, in 2000 or so, the Minneapolis Tribune did a “Variety” piece inviting its readers to send in their pictures of flags they’d like to see representing Minnesota. The series did not result in any very serious examples–mostly for fun. There were pictures of wall-eyed pike, loons, Vikings, big trees, Paul Bunyan, maps of lakes and the like —even snowmobiles; and most of them had lots of words on them. It was doubtful that the participants or the newspaper took the idea in seriousness. In their July/August 2001 issue, the Utne Reader presented an article critiquing the “blandness” of flags of the fifty U.S. states; while challenging readers for entries of redesigns they would rather see. I was not able to resist and so, sent in my more “tuned” and refined version of my first design. Utne liked it well enough to declare mine the “winning design for the State of Minnesota Flag.” I have to admit, that turned my head a bit. Then, a year or two later, I read of Senator Edward Oliver (R-Deephaven) comments about how rarely he saw Minnesotans displaying the flag of our state—implying that the reason was that the design of the flag was just not very moving or inspiring enough to cause people to show much pride in it. I thought these ideas matched my view, too. So, I wrote to him and sent him a picture of my flag; he said that he liked it– well enough to include me in an invitation to attend a press conference he was calling to announce his intention to submit a bill to consider change of the flag design. 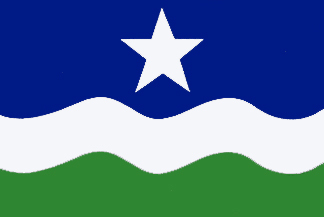 On the 19th of February 2002, in the Minnesota State Capitol Press Room in St. Paul, Senator Oliver introduced legislation (SF 3201) to form a commission to examine proposals for a redesign of the Minnesota flag. Senator Kiscaden (D-Rochester) was also there and some reporters from Twin cities newspapers and some TV coverage, as well. I was presented with my flag along with a gentleman from Rochester, Lee Herold, with his. What I remember the clearest at the time, was how surprised Lee and I were at how much our designs resembled each other. At the time I yet had not been aware of any other serious designs; and Sen. Oliver had expressed no support of any particular selection of a design. I learned later, how long before that, Fr. William Becker and Lee’s design had been around in earlier attempts to get the attention of our State legislators. Although Oliver’s bill failed to make it out of committee (voted down, March 26, 2002), it was a proud moment to attend its birth. Living 250 miles from Saint Paul makes it difficult to be present for committee presentations; thus, staying on top of any State Capitol news, about actions taken and so forth, fell into Mr. Herold’s capable hands. Lee has been very kind in keeping our Minnesota flag network informed about anything legislative that even remotely smells of interest in our mutual cause. Since Sen. Oliver’s retirement there was little interest until March of 2006 and again recently when similar bills were introduced in both houses: HF 1385 and SF 1454 (see sidebar).